OpsDash comes with powerful but easy-to-use alert notification routing and suppression features. You can define routing parameters for specific notification types to ensure your team isn’t overloaded. OpsDash makes it easy to post notifications to Slack, HipChat, Mattermost or send them via Email. You can also easily integrate with leading incident management solutions, including OpsGenie, PagerDuty and VictorOps or use WebHooks for custom processing. With OpsDash, you can easily set alerts for upper and lower limits for any metric. Both critical and warning limits can be set. Just click on the graph in your OpsDash dashboard, and enter the appropriate values under alert settings. You can configure OpsDash to send alert notifications via e-mails, HipChat messages, Slack messages, and Mattermost messages. 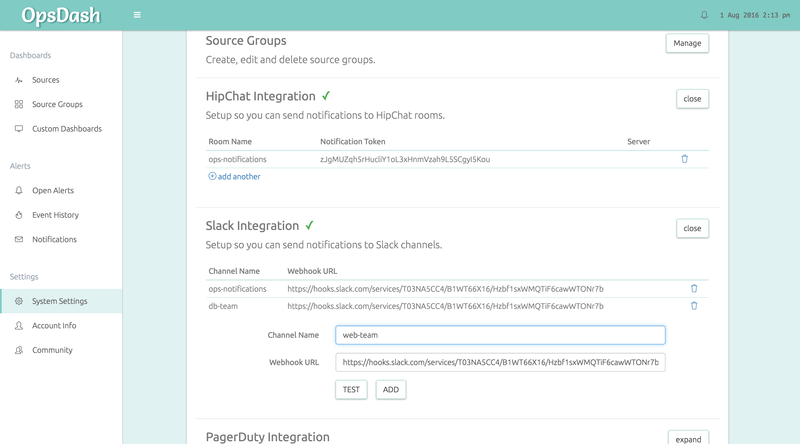 You can also raise incidents in PagerDuty, OpsGenie and VictorOps when alerts occur. Looking for something else? Set up Webhooks in the OpsDash UI to receive alert notifications and do custom processing. OpsDash comes with powerful but easy-to-use notification routing and suppression features. Find out more about how to set up alerting and notification in OpsDash here.